PLACEMENT WISE TOP 10 ENGINEERING COLLEGES IN CHANDIGARH ,The future of an engineer depends upon hisskills and the college which he has chosen as a career guide. Here we willspecifically discuss for the region of Punjab and Chandigarh. Students alwayslook to get placement wise top 10 B.tech colleges in Chandigarh. But the majorconcern is whether you are in the right process of selection or not. A studentwho is looking for placement wise top 10 B.tech colleges in Chandigarh has tobe smart during making any decision. Sometimes attractions are much more than therealities. Hence we will guide you to avoid these kinds of stuff and just focuson the real facts of data which assures you the best. In this regard, we arepresenting you the list of placement wise top 10 B.tech colleges in Punjab sothat you could judge from yourself. The Institution was established in the year 2009 with a clean motto to deliver best results to society. Here we understand that engineers are the building blocks of the nation hence they need to guided and educated in a proper way. At Universal group of institutions, you will get a chance to groom yourself in a personal and professional way. Well qualifies staffs are working here who are having experience of more than a decade. Properly designed campus with Wi-Fi facility is available so that student could be in contact with the internet and get all required information instantly. Well maintained and equipped labs are there through which student will learn the practical concepts of respective subjects with advanced instruments. The institution is located at Lalru near Chandigarh with best transportation facility. Complete medical facilities are also available. 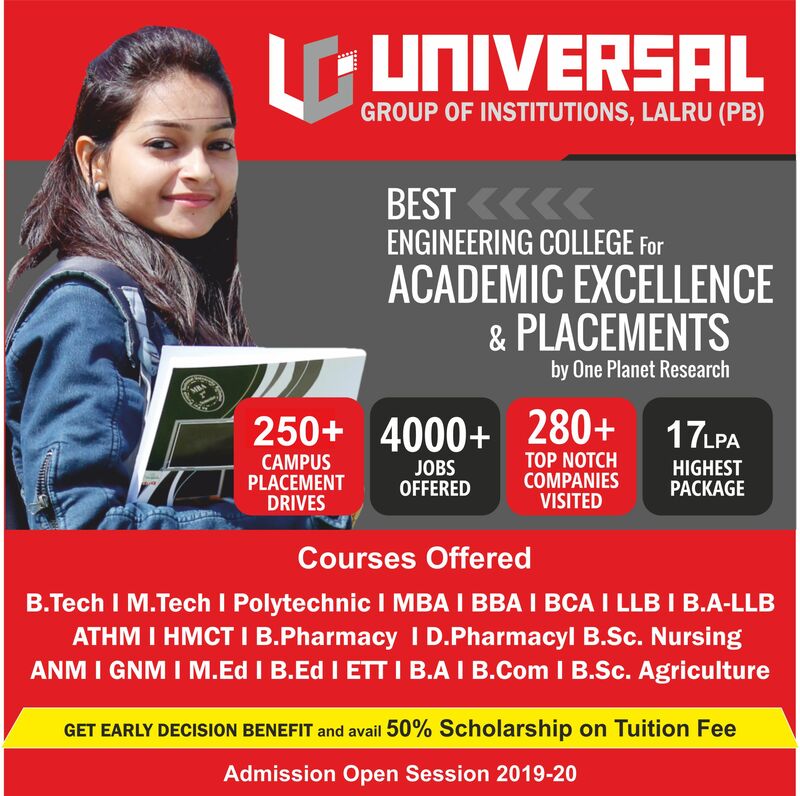 Hence if you are looking for placement wise top 10 B.tech colleges in Chandigarh then Universal Group of Institutions could be an option for you. The university was formed around the year 1958 under the affiliation of Punjab University. Various Engineering courses are being offered here under the guidance of experts. Placement wise this college has made the future of lots of individuals hence if you are having a plan to make the career in the field of chemical engineering then just check out all the details at the web portal of the institution. Aryans College of Engineering is the best placement wise top 10 B.tech colleges in Chandigarh hence this can also be an option to explore. It was formed in the year 2009 by getting affiliation from PTU that is Punjab Technical University. A university which can be called as “Rising University” is none other than Chandigarh University. In the shortest frame of time, the University has made its place by giving the enormous result. So students can also check Chandigarh University as an option for their career. This engineering college is especially founded for girls in the year 2008. So girls who want placement wise top 10 B.tech colleges in Chandigarh can explore the options here. We hope this content will help you to get placement wise top 10 B.tech colleges in Chandigarh or Punjab. Do not hesitate to reach us in case of any query. We love to hear from you.